Click the picture on the left to download all 3 posters. Looking for centers for geometry? 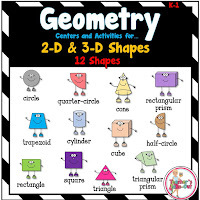 This pack is loaded with over 80 pages of Geometry Centers and Activities for K-1 Classrooms. It includes the shapes of: squares, rectangles, triangles, circles, trapezoids, cones, cubes, half-circles, quarter circles, triangular prisms, rectangular prisms, and cylinders. 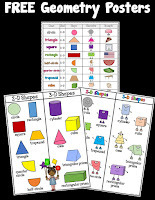 This pack includes games, centers, and worksheets to help build your geometry unit.